Burlington, WA – There is not much love lost between the owners of Sakuma Brothers Farms and Ramon Torres, the president of Familias Unidas por la Justicia. Sakuma Brothers is one of the largest berry growers in Washington state, and Familias Unidas is a grassroots union organized by the company’s workers. Torres used to work in the Sakuma fields. He was fired after the strikes by pickers in 2013 in which the union was formed. This month, on September 12, the workers finally voted in an election to demonstrate what really needed no proof – that they supported the union they formed three years ago. 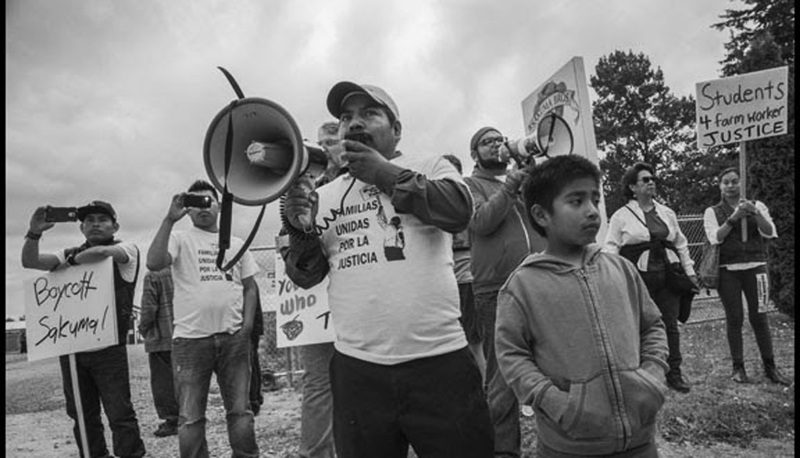 This election is a watershed: Familias Unidas por la Justicia is the first union organized by farm workers in the United States in many years. The balloting took place over four hours at the company office, two hours north of Seattle, surrounded by Sakuma’s blueberry fields. After all the votes had been cast, Torres and a small group of workers and supporters drove over to the polling place to watch the count. A company manager balked, however. The ever. The count couldn’t take place as long as Torres was on the property, he said. After a lot of arguing, the workers retired to a local schoolyard, together with Richard Ahearn, former regional director of the National Labor Relations Board. There, on the tailgate of a pickup belonging to State Senator John McCoy, Ahearn counted the ballots. The result: 195 for the union, and 58 against. The union is a grassroots organization formed by the pickers themselves, and is led by indigenous Mixtec and Triqui migrants from the southern Mexico states of Oaxaca, Guerrero and Chiapas. A union contract at Sakuma Brothers could give this union the stability and resources needed to make substantial changes in the economic conditions of its own members, and of farm workers across western Washington. The union in Burlington won the loyalty of the Sakuma workforce through three picking seasons of strikes and direct action. Almost all of the work stoppages challenged the company over low wages and its methods for calculating the piece rate, in which workers are paid according to the quantity of fruit they pick. Before he was fired in 2013, Torres was chosen by workers as their spokesperson while attempting to set what they considered fair rate: one that would guarantee $14 per hour. “Last year they were paying $10 an hour, which they say is a lot,” said Familias Unidas vice-president Felimon Pineda, a Mixtec picker and former Sakuma employee. “But they demanded fifty pounds per hour to get $10. For five pounds more there was a bonus of $1.50, or $11.50 an hour. Only the workers who work fast could get that, though.” When workers walked out to protest, supervisors called the police to expel Pineda from the field. When the season began this year in June, workers walked out over a piece rate of 24 cents per pound for picking strawberries. In August, FUJ members in Sakuma blueberry fields walked out again. A day earlier, workers explained, management was paying 60 cents per pound, and then lowered the price to 56 cents. During all the walkouts, workers also demanded that Sakuma sign a union contract. A 35-member union committee of workers in the field organized the walk-outs. In addition, the union has another 25-member committee shaping anger over conditions into proposals for a union contract. In 2013, Sakuma’s owners seemed willing to negotiate with the workers, but when those talks failed to raise piece rates, the new union launched a boycott of the company’s berries. The boycott initially focused on local sales under Sakuma Brothers’ own label. But soon the workers discovered that Sakuma was selling berries through one of the largest agricultural marketers in the country, Driscoll Strawberry Associates, or Driscoll’s. Driscoll’s is the largest berry distributor in the world. It does not grow its own berries, but controls berry production by contracted farmers. It has contracted growers in several countries, and has received loans guaranteeing foreign investment from the Overseas Private Investment Corporation, a U.S. government agency. Marketing berries has become highly monopolized. Four shippers control one-third of all blueberry shipments in the United States. During the peak season, Driscoll’s moves 3.8 million pounds of fruit daily, and up to 80 percent of the fruit is shipped on the same day it’s received from growers. Sakuma Brothers has been supplying berries to Driscoll’s for 25 years. An extremely positive company profile on the front page of the business section of The New York Times the day before the Sakuma election (and which did not mention the boycott, the election, labor strife, or even the farm workers themselves who produce Driscoll’s berries) announced Driscoll’s new national marketing campaign. While the company wouldn’t tell the Times how much it was spending, the article estimated that similar campaigns spend $10-20 million on advertising. “The public will get an introduction to the people Driscoll’s calls its Joy Makers-agronomists, breeders, sensory analysts, plant pathologists and entomologists who will explain how the company creates its berries,” the article enthused. Rosalinda Guillen, director of Community2Community, a farm worker cooperative and advocacy organization in Bellingham, says Driscoll’s image burnishing actually made it more vulnerable to a boycott. “It made the company more exposed, because of the way it markets itself,” she explained. Guillen started helping farm workers organize unions in Washington over two decades ago, and spent several years with the United Farm Workers in California. When the strikes first erupted at Sakuma Brothers in 2013, workers called her in to help plan strategy and organize support. Starting in the area between Seattle and Burlington, the workers urged students and progressive community activists to set up boycott committees and begin picketing supermarkets, and asked shoppers not to buy Driscoll’s berries. As that activity increased, Torres and several workers and supporters made a trip down the west coast this spring, setting up more committees as they went. 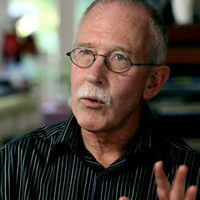 “I wouldn’t say (the boycott) is threatening the survival of the farm. I would say it’s an annoyance,” Sakuma spokesman Roger van Oosten claimed earlier this year. Maybe so, but the company started to feel the effects of labor pressure. It had to give $87,160 in retroactive pay to pickers who worked in 2014, after a court ruled piece-rate workers must be paid separately for ten-minute rest breaks. And in a 2013 class-action lawsuit brought by two Sakuma workers alleging pay violations, Sakuma settled out of court by paying 408 workers $500,000 and their lawyers $350,000. Driscoll’s image also took a hit after a strike organized by pickers in the San Quintin Valley of Baja California in 2015, when as many as 60,000 farm workers stopped work and confronted heavy police repression. Last year these workers also decided to organize an independent union, and announced their support for a Driscoll’s boycott. The area’s largest grower, BerryMex, is owned by the Reiter family, which also owns Driscoll’s. Sakuma Farms and BerryMex aren’t just connected by a common distributor, Driscoll’s, but by the workforce that picks the berries. Agricultural labor in virtually all the berry fields on the Pacific Coast comes from the stream of indigenous migrants from southern Mexico. In May this upsurge among indigenous farm workers erupted in California as well. Over 400 farm workers in McFarland, in the San Joaquin Valley, walked out of the fields at another grower protesting low wages and company abuse. The farm’s owner, the Klein Management Company, produces clamshell boxes of blueberries sold under the Gourmet Trading Company label. “The majority of the people here are from Oaxaca-Mixtecos and Zapotecos,” explained Paulino Morelos, who comes from Putla, a town in Oaxaca. At the beginning of the blueberry-picking season in April, the company was paying pickers 95 cents per pound. By mid-May, the price had dropped to 70 cents, and then 65 cents. Finally, the company announced it was dropping it again, to 60 cents. Workers refused to go in to pick. After leaving the fields, workers approached the United Farm Workers, which filed a petition for a union election. The union won by a vote of 347 to 68. California has a law, called mandatory mediation, with virtually the same arrangement. Signed into law in 2002, it has been used by the UFW to get contracts at several large companies. This law, however, is now on appeal before the state’s Supreme Court, challenged by Gerawan Farms in Fresno, one of the world’s largest peach growers. “But the first place we had any arrangement like that was here in Washington, even before California,” Guillen says. She and other organizers came up with it to help workers win a contract at Washington’s largest wine company, Chateau St. Michelle. That contract was signed in 1995, and is still in force today. The AFL-CIO’s Jeff Johnson welcomed Familias Unidas into the Washington State Labor Federation last year, which helped gain the cooperation of Richard Ahearn in administering the election. As a retired director of the National Labor Relations Board, his participation highlighted another irony. Farm workers (along with domestic workers) were excluded from the National Labor Relations Act in 1937, which set up the union election process for other workers. California is still the only state with a law establishing such a process for farm worker unions (and recently passed a law ending the exclusion of farm workers from the overtime rights other workers have as well). At the same time, however, growers are increasingly searching for a low wage workforce impervious to unionization, through the expansion of guest worker programs. Sakuma Brothers itself tried this tactic in 2013 and 2014. In 2013 the company brought about 70 migrants to the U.S. under H2-A work visas. This Federal program allows growers to recruit workers outside the country for periods of less than a year, after which the workers must return to their country of origin. Guest workers who lose their jobs by offending their employer or not working fast enough have to leave the country. That makes joining a union or protesting conditions extremely risky for them. Growers can only use the program, however, if they can claim they can’t find local workers. After the 2013 strikes, Sakuma sent strikers form letters saying they’d been fired for not working, and then told the U.S. Department of Labor it couldn’t find any local workers. It applied for H2A work visas for 468 guest workers, enough to replace its entire workforce. Strikers all signed letters to DoL saying they were willing to work, and the company eventually had to withdraw its application. While Sakuma Farms gave up its guest worker plan, at least for the moment, other agricultural employers in Washington have increased the number of H2A workers drastically. The Washington Farm Labor Association, according to Alex Galarza of the Northwest Justice Project, brought in about 2000 workers in 2006. In 2013, the year FUJ was formed, the number rose to 4000. Last year it exploded to 11,000, and may reach 16,000 for 2016. Almost all the migrant workers who make up Familias Unidas have been living in the U.S. for many years, however. They cannot go back to Mexico, or cross the border to return to the U.S. They are at the northern end of a migrant journey that took many, like Pineda, through San Quintin or the other agricultural valleys of northern Mexico years ago. About half live in California, and come to Washington for the harvest every year. But Pineda and an increasing number are settling in Washington for good.